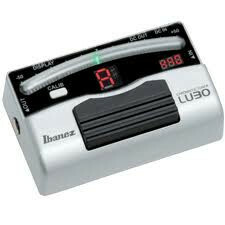 Ibanez LU30 Guitar Pedal Tuner - Strict accuracy, Easy operation and Ibanez reliability. The Ibanez LU30 features aluminum die-cast housing as well as an easily visible LED display. We put a high priority on creating an easy-to-see display in a compact size tuner. It fits perfectly even in the limited space available on effects boards. One output of the LU30 is muted when it is turned on.